Juliette and airline pilot boyfriend Nate have split up. Nate needed 'space' from their stifling relationship. The only problem is, Juliette still loves Nate and will do anything to win him back. And OH BOY, do I mean ANYTHING! Not wanting to let slip any spoilers, this book is an excellent debut psychological thriller from author Karen Hamilton. I was on the edge of my seat wondering what craziness would happen next! The author has created a fantastic tale of unrequited love and the insane lengths one woman will go to for her Happy Ever After. Juliette was 'damaged goods' long before hooking up with Nate. An early childhood tragedy followed by bullying at boarding school left her continually searching for the better life she deserved. Craving acceptance by her school peers, especially the beautiful and sophisticated Bella, she was forever on the periphery; always the outsider. When Nate came along, she had their whole lives mapped out - love, marriage, babies, growing old together - but Nate's rejection brought it spectacularly crashing down around her! What a wonderfully complex character Juliette is. She's a masterful manipulator with one viewpoint - her own. She knows what she wants, and how to get it, to make life complete; yet she's vulnerable and flawed. I compliment the author on her creation. 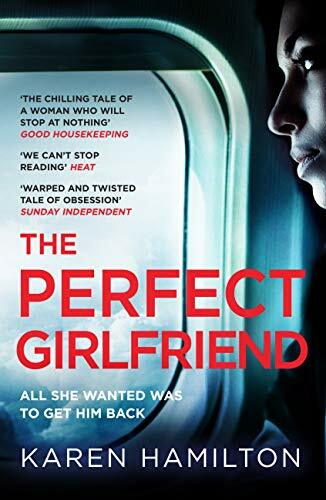 The Perfect Girlfriend is the perfect twisty story of an obsession that's dangerously out of control. Can Juliette be stopped before she goes too far? Read it and see! I received an Advance Reader Copy. My thanks to NetGalley, Karen Hamilton and Wildfire. I caught the travel bug after an early childhood spent abroad (Angola, Malawi, Zimbabwe, Belgium and Italy) and have worked as cabin crew for a major airline. In 2006, my husband and I put down roots in Hampshire and four years ago, I gave up flying to raise our three sons and concentrate on my writing. Now that they are a little older, I've begun travelling again (as and when it's possible) and enjoy exploring places through their fresh eyes. The Perfect Girlfriend is my first novel (due Spring 2018). It is a psychological thriller about a sociopathic flight attendant, Juliette Price. The book is rooted in my work experience, but not autobiographical! I realised early on in my flying career, that the moment I changed out of uniform, I became anonymous. It made me think about the identities behind uniforms and work personas and became an idea that would later help create my protagonist. When Juliette is dumped by her pilot boyfriend, Nate, her dreams of a 'happy ever after' are thrown into jeopardy. She vows to win him back, whatever it takes. She surreptitiously embeds herself into his life by adopting a new persona and securing a position as a flight attendant with the same airline. However, these are only the first steps in her master plan as she reveals just how far one woman will go to achieve her dreams.